When it comes to autumn- I am a natural girl over here. Pumpkins and flowers and wheat and freshly fallen leaves... and mostly in a neutral palette. Orange pumpkins? Maybe just a touch outdoors. But white and soft faded colored pumpkins? On repeat again and again. I haven't found any pumpkins yet this year- so today I am into the archives and I am sharing 10 simple ways to decorate with white pumpkins. 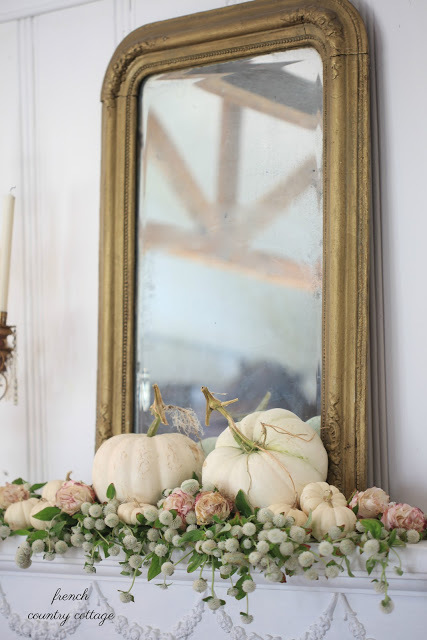 A simple seasonal display for the mantel- gomphrena and dried peonies topped with white pumpkins. 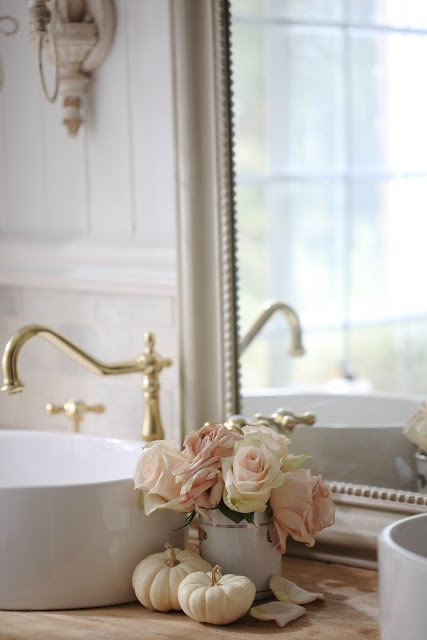 Add an antique gold mirror to play off the warmth. 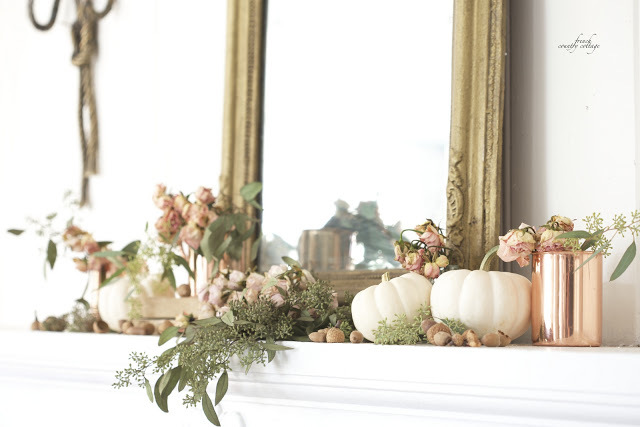 Carving out a pumpkin and tucking some flowers into it for a table centerpiece? Why not? And it is so easy to do. 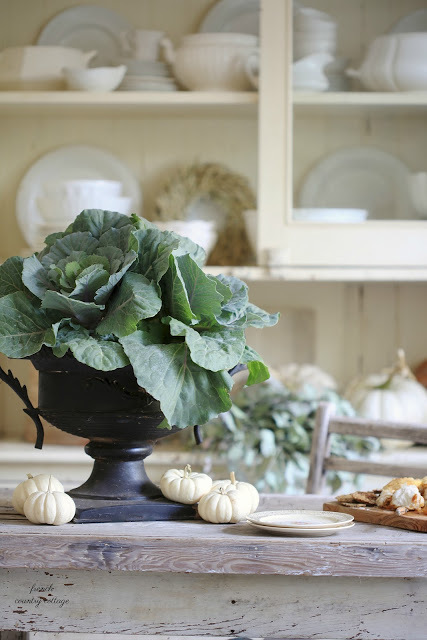 Big cabbages are always charming for fall displays. Place a large one in an urn or pot and gather a few baby boos around for a simple seasonal touch. 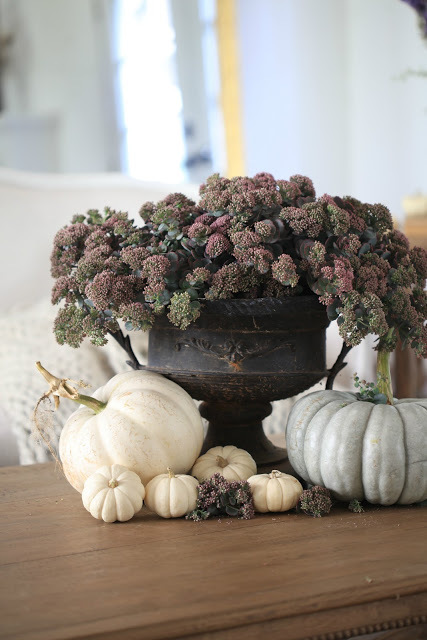 Simply stack white pumpkins and a few grays if you would like- around a pretty sedum- which has the perfect colors for a natural autumn look. I have been known to tuck a touch of autumn into every room- even the bathroom. Just a couple baby boos with flowers is a sweet touch. 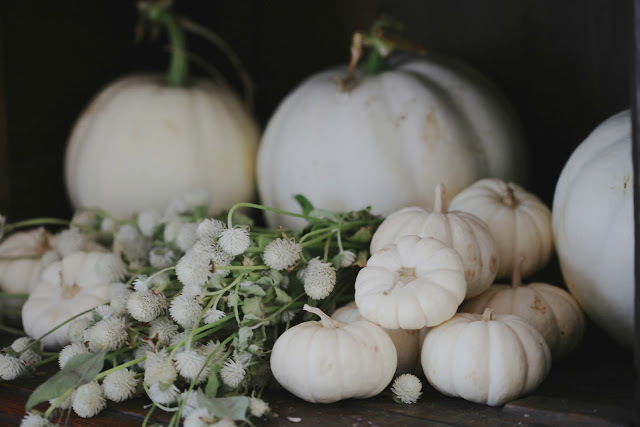 Open cupboards, shelves and more- a gathering of white pumpkins and a few seasonal flowers on the shelf is a simple way of saying 'autumn' without overwhelming the space. 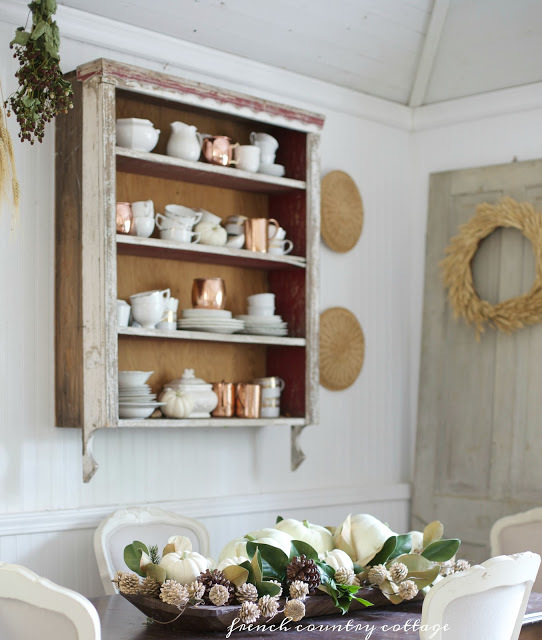 Gather up a few fresh or faux magnolia branches and top them with pumpkins and call it good. A simple, easy seasonal display in minutes. 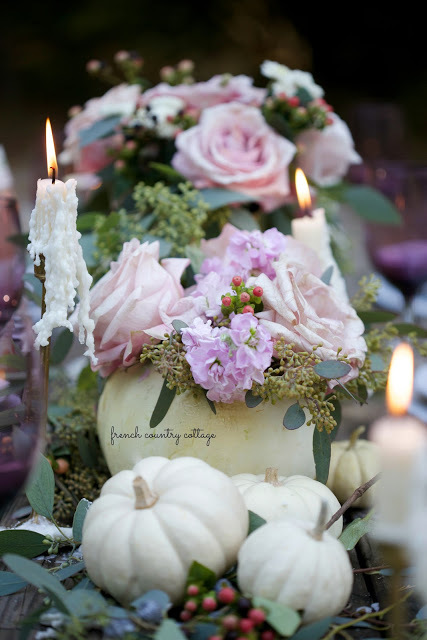 Because blush roses and eucalyptus are perfect with white pumpkins. 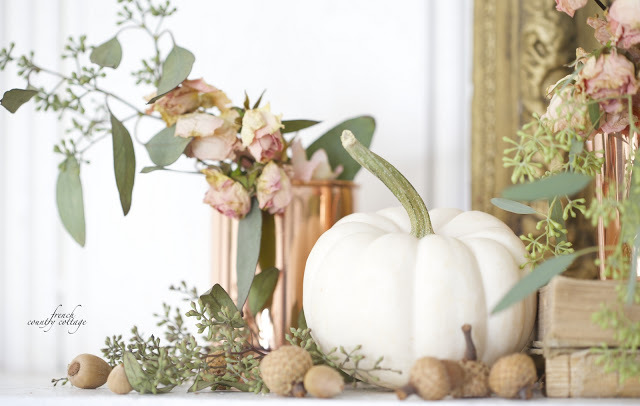 Copper mixes beautifully with the warm tones from dried roses and sage green eucalyptus, acorns and white pumpkins. 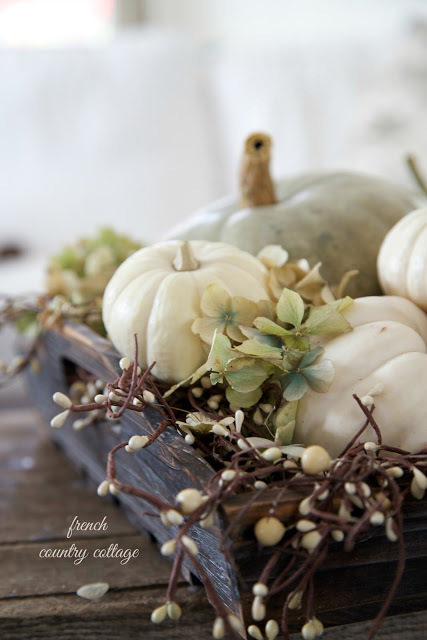 So simple- grab a vintage wood crate, add a few sprigs of hydrangea and white berries and fill it with pumpkins. It is one of my go-to decorations every year for simple autumn. 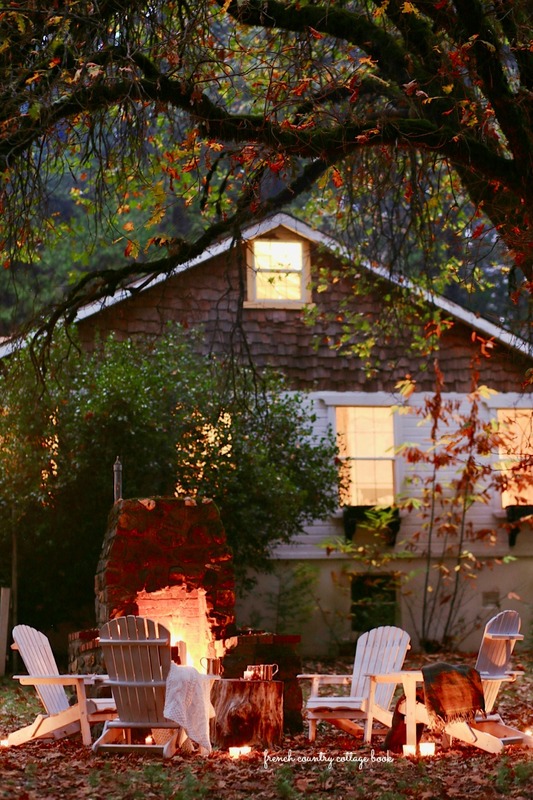 Several of these autumn ideas are in my book as well. We included autumn and Christmas decor along with a few ideas for celebrating birthdays in those pages. Happy Tuesday that feels like a Monday everyone. Your white pumpkin images are such an inspiration. It may be a few weeks before we get any. I'll take them over orange any day. So gorgeous. Courtney, I added almost every one of these ideas to my Inspired Autumn board. 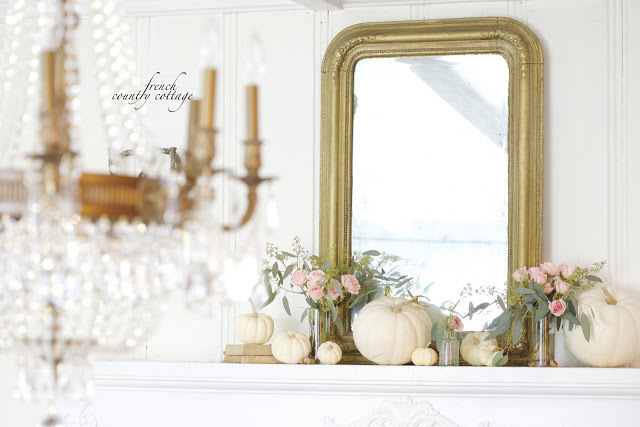 I tend to decorated with white or soft blue pumpkins, and perhaps add in one of the soft melon colors. Like you, I save the orange pumpkins for outside. Gorgeous as always...I cannot wait til the white pumpkins hit the Farmers' Market here! Happy September Courtney! So elegantly done! I Love the color combinations. Just love these photos! I love the soft colors with copper and sage leaves. Stunning combination! Beautiful, a lot of work went into these displays, well done!